So, What is Secondary Storage Cohesity-Style? Just as you’ve managed to wrap your head around the craziness that is the world of modern storage comes an emerging concept: secondary storage. At first, you may think that the term secondary storage in the context of modern storage is simply a different way to refer to backups. Not so, according to Cohesity. Cohesity is working on redefining this term to encompass pretty much any storage needs that are not assigned to be directly supported by primary storage. Clear as mud? Ok, let me go a bit deeper. Your database applications are absolutely mission critical and need to be on high performing storage with plenty of capacity. However, the backups of your database systems (the ones that run on your primary storage) – and you may have many backups per database – shouldn’t necessarily reside inside your primary storage environment. That’s a key purpose behind secondary storage. Now, let’s look beyond those mission critical primary systems at something like a DevOps-driven environment (by the way, DevOps is a culture, not a product). In a development world, you’re standing up copies of your environment pretty regularly and then tearing them down as developers work to refine their code. You probably don’t want or need this activity taking place in your primary storage environment, but it needs to happen somewhere. This, says Cohesity, is where modern secondary storage comes into play. It’s not just for backups, but that doesn’t mean that backups aren’t one of the recommended use cases. Often times, these services require products from a variety of vendors. The more products that you have to deploy, the more you have to spend, the more you have to manage, and the more licenses you need to track. Besides being potentially expensive, it’s also inefficient. You are probably forever copying data between various product or application silos, thereby increasing administrative overhead and saving a lot of copies of data around the environment? According to Cohesity, data growth in secondary storage is growing at a rate of 50% year over year and this is largely due to the fact that there are so many data copies strewn about. This is also referred to as “dark data” since there’s little visibility into what it is and why it exists. The Cohesity platform is not just a simple storage target, though. It includes some features that drive to the heart of a number of challenges faced in enterprise IT today, including the dreaded “I/O blender.” The I/O blender is a phenomenon that has plagued traditional disk-based SAN devices. Because legacy SAN devices are the epitome of shared infrastructure, they are expected to withstand constant assault by myriad kinds of data hitting the device. We have a mix of protocols, block sizes, randomness, and much more than can bring a SAN to its knees and kill all of the workloads. Cohesity’s platform includes a performance isolation feature that helps to prevent a single application from bringing everything down. The platform also includes a number of capabilities that you find in storage these days, including high availability, commodity hardware, and great scalability (although Cohesity has only tested to 32 nodes so far due to hardware acquisition challenges). Cohesity indicates that the architecture should lend itself to “infinite” scalability. On the scale front, you need to start with a minimum of three nodes, but from there, you can grow by a single node at a time. Each node is one server in a 2U chassis that supports up to four servers per chassis. For every four servers you add, you need to add a chassis. 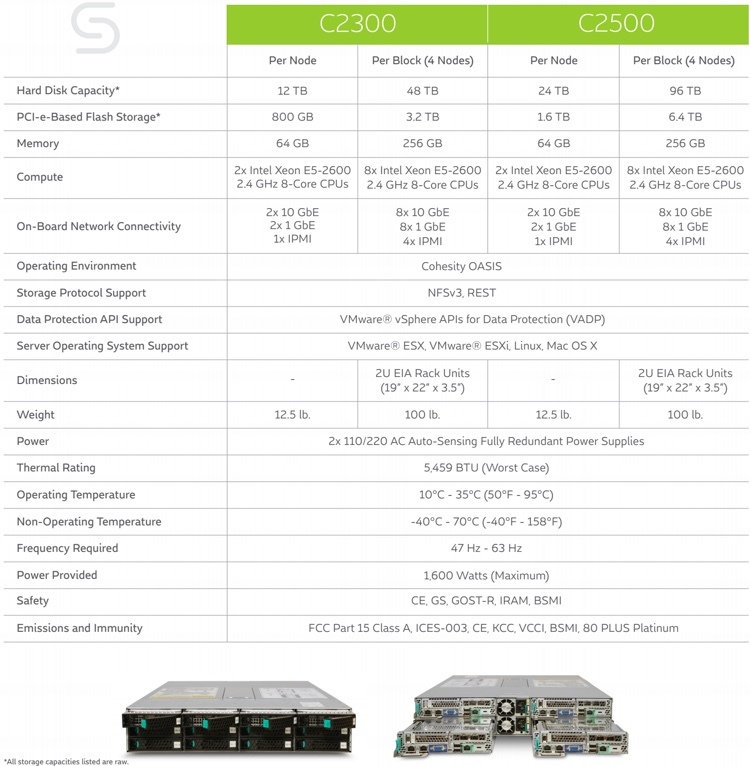 At present, Cohesity has two models available, each of which is described in the chart below. The analytics tool does need some additional fit and finish, but Cohesity has the guts built into the system so that this shouldn’t be all that difficult. As a new company seeking to redefine an entire space, Cohesity has a lot of work to do in educating the market about what they do and how they fit into the enterprise market. Having just GA’d their solution just days ago, this is a company that is still working to define itself in an increasingly crowded storage market and one that is continuing to develop their platform. Like many v1 products, there are some things that run really well, but there are also gaps that the company will address as they move forward.